In the first days of the sanctified months, in the date of 1st of Dhul Qiddah, 1436 AH, corresponding to 16/8/2015 CE, the murderous army of Bashar committed a horrendous massacre killing tens of civilians in the city of Douma in the rural areas of Damascus. The planes of the murderer Bashar targeted a market in the city with nine vacuum rockets, all meanwhile a heavy shelling of artillery scoring 110 martyrs with women and children amongst them, in addition to 300 injured. Not a day passes except that we see yet another massacre committed against the Muslims in the Blessed Land of Ash-Sham, one time committed by the regime of the butcher Bashar, and one time committed by the Crusade Coalition. The result of this is thousands of martyrs, and double that the amount of injured people, and all this is happening under the eyes and ears of the world. 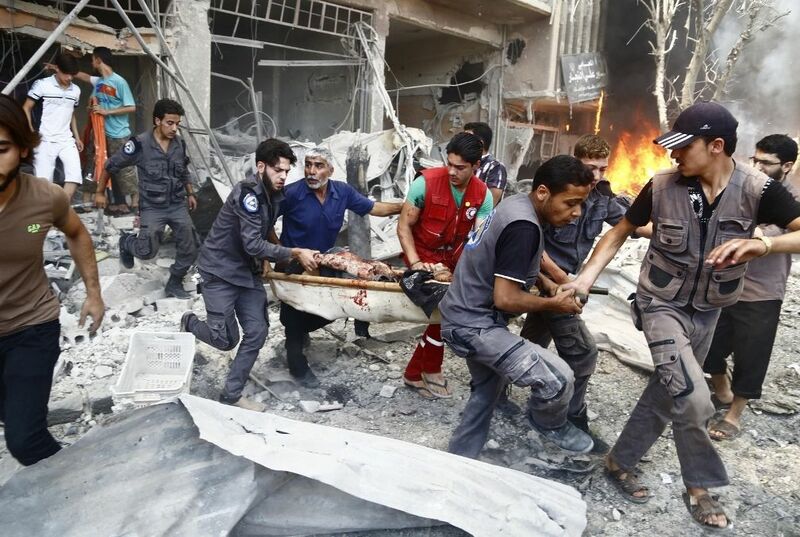 The rivers of blood that flow heavily do not move even a single hair on the body of the International Community, not even those who falsely and misleadingly claim that they are the friends of the Syrian people. Still you find the planes of the murderer Bashar killing more than 110 Muslims, with women and children among them, after less than a week on the massacres committed by the crusade Coalition in the bordering village of Atma. "اور اس دن مومنین اللہ کی مدد سے خوش ہوں گے وہ جس کی چاہتا ہے مدد کرتا ہے اور وہی زبردست اور مہربان ہے"